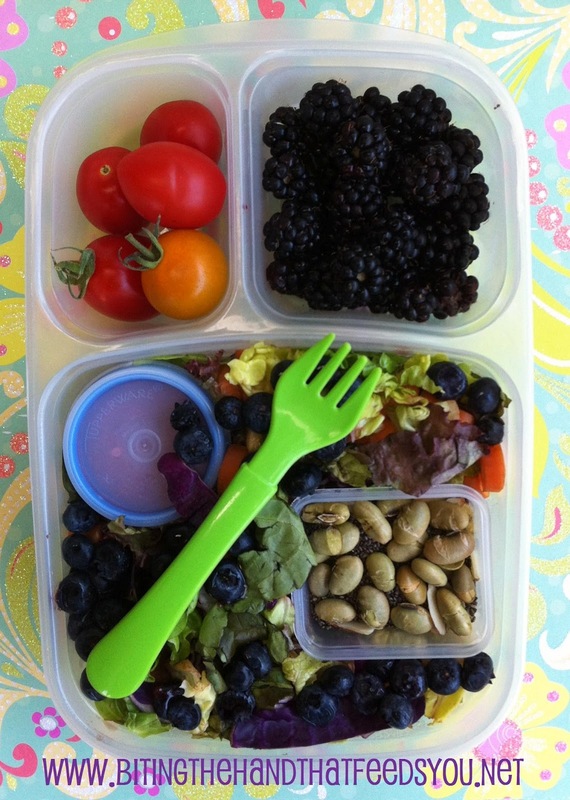 Wednesday, 9/12/12 - Z and I needed lunches, since this was the first day at the co-op preschool for E's baby class. Followed by school for Z. I knew Z's class was reviewing the letter "L," so when I asked what she was learning, and she said "L," I foolishly mentioned that "Lalaloopsy" started with an "L." And maybe I could make her a Lalaloopsy lunch someday. Dummy. I was originally going to make Tippy Tumbelina, since that was her first Lalaloopsy doll, and I had some ballet-themed cupcake toppers I could incorporate. But then we got home and I couldn't find her Tippy doll, only the Sugar Cookie Crumbs (or whatever the name is. I can't be bothered to memorize them all...) that she got for Christmas. 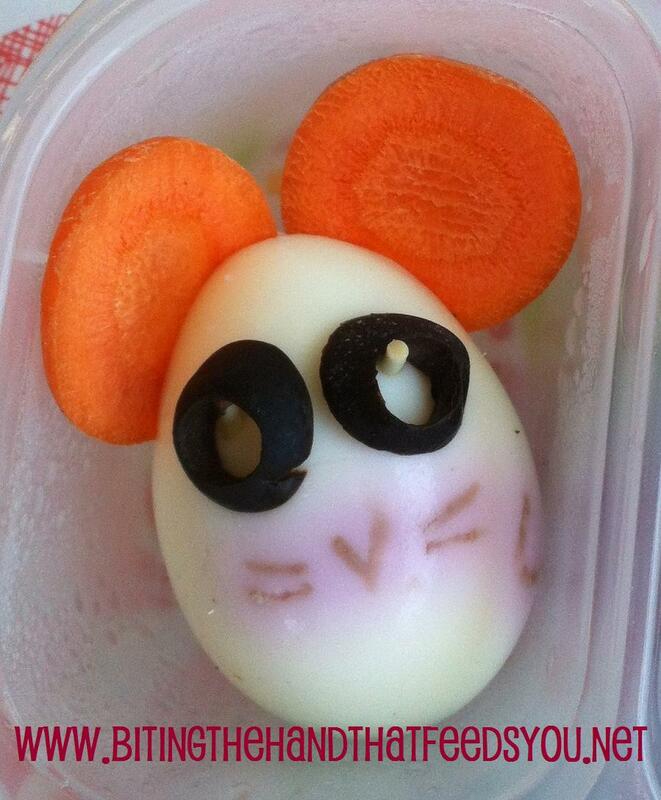 Plus Cookie's mouse would be easy to do with a boiled egg, versus Tippy's swan thing. 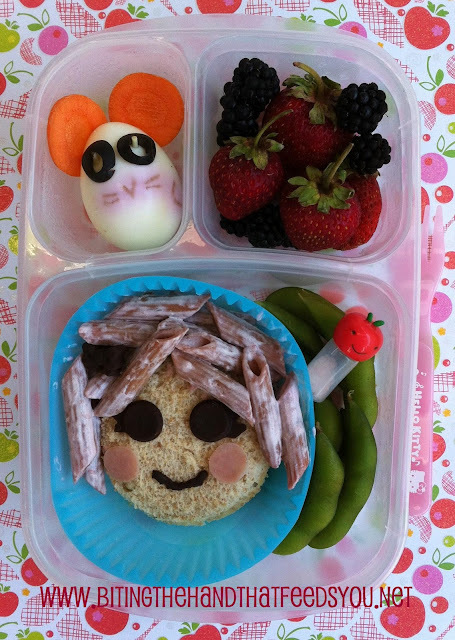 And it got Z to stop moping around asking about her Tippy doll when I told her we'd make a Crumbs doll lunch. The Mouse Thing: Each Lalaloopsy character has a little minion pet, but I couldn't find the mouse's name, if it even has one. I hard-boiled one of the free-range eggs I got as a bonus in my CSA share and used a knife to slice slits in the top sides. Two thinly cut carrot coins from a largish organic carrot made the ears, and some bits of uncooked spaghetti noodle and two olive slices made the eyes. I used some natural food color gel and a toothpick to draw on the facial features, and I tried to draw a tail coming from the back. Meh. At first the colors bled really badly, so if you choose to color on eggs, here's a tip: blot the liquid off the egg first! Luckily the colors faded into the egg overnight, so it actually doesn't look as bad as it did when I made it! I used a little DIY funnel out of a scrap of paper to put some pink salt into a little apple-topped sauce bottle for her to add to the egg later. 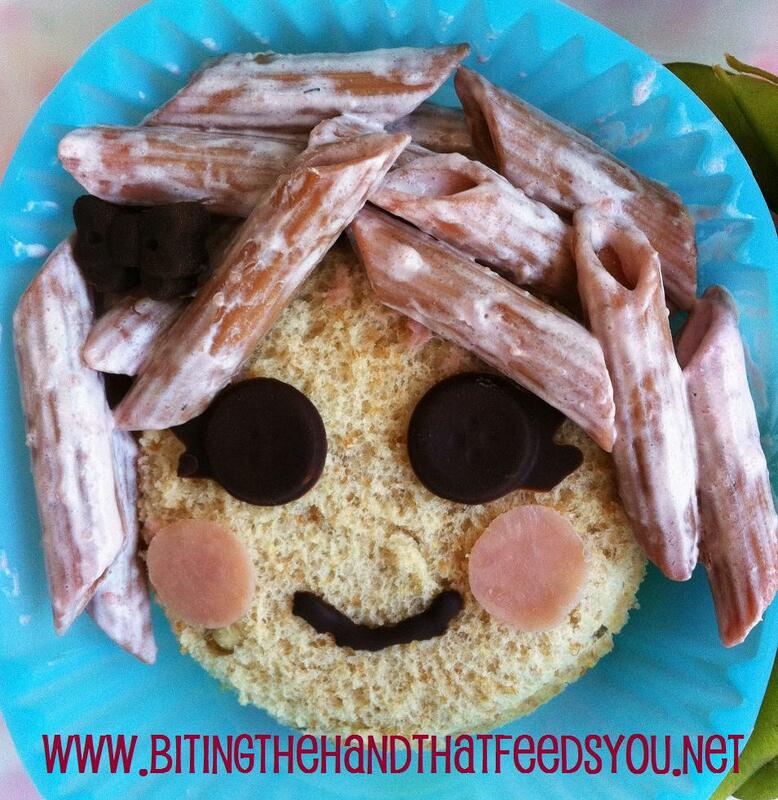 Lalal-Oopsie: My original plan had been to use my homemade beet dye to color the noodles pink for hair. Easy as pie, right? Bzzzzt! Wrong! I used whole wheat noodles, and they refused to change color! I tried reducing the water and added the whole jar of color, and still nothing! I was lamenting to my bento buddies on Facebook about my epic fail, and Candy Girl from BentOnBetterLunches suggested I make a cream sauce and just color it. Fine. I was desperate! Saving Face: For the face I used a biscuit cutter on some bread and ham. I used a mini circle cutter to cut some ham scraps into cheeks. Lotta Chocolate: My sister loves to melt chocolate to make chocolate-covered strawberries, so whenever I find dark chocolate Dove Promises or bars on super sale, I stock up. Sadly, these all have Vanillin, a fake vanilla flavoring that Z reacts to if she gets too much. I can let the occasional dye-free cupcake slide in an "emergency" (ie: I forgot to bring a safe alternative to her cousin's party,) but not if she also had some recently from, say, Nutella. So we've cut it out of the regular rotation of foods and I'm slowly clearing it out of the house. *sigh* My sister is gonna be sooooo excited to get a grocery-bag full of dark chocolates to make treats with. That she doesn't have to share with us. Since if my babies can't eat it, I try and avoid it as well. (When they're watching, anyways!) She's also going to get my huge stash of Lindt truffles, since they're no good for us either, and I just can't polish them off all on my own! I microwaved a mug of water to get it hot, then pushed the bottle into it to get the chocolates to melt. I massaged the sides and put it back in a few times until we were good. Then I made eyes using a mini button chocolate mold. After filling the button molds, I had the chocolate mound up a bit at the back to make them thicker, then trailed off some lines to make eyelashes off the sides. I used a mini bow chocolate mold to make the hair bow. And finally I just squeezed a smile directly onto the sandwich from the bottle. I let my molds sit out on the counter for a while to cool, then popped them in the fridge a few minutes before I was ready to put them on the sandwich. Hair We Go! : For the pesky noodle hair, I combined some cream cheese, canned parmesan cheese, and milk in the microwave for 30-60 seconds (I forget) until it was all melty, then added a few drops of natural red food color gel and mixed together with the noodles. I don't have exact measurements since I wasn't making a full batch, so I just winged it. Not exactly what I'd had in mind, but good enough! Well. She LOVED it. L-O-V-E-D it! She made me feel like the bestest Mama in the whole wide world! I really wish I'd gotten a photo of her with it. She was initially a little thrown by the pink "Mac-n-cheese," but quickly recovered. Tasted okay to me, but it ended up being the only bit of the lunch left over at the end of the day. and raspberry vinaigrette. Almonds, dried soy beans, raisins, and chia seeds. My lunch was fairly quick to toss together. I had pre-made my salad base for the week, so all I had to do was add the fruit topping and sides. The pointy tomatoes came from Unka Seesee's garden, and the smaller roundier ones came from my organic CSA. The blackberries were all u-pick... from my back yard! Red tomatoes and lettuce, Orange/Yellow carrots and tomatoes, Green lettuce, Blue/Purple blueberries, blackberries, and cabbage. In my Easylunchboxes Mini Dippers container with the other dried salad toppings, I added in a Tbsp of MILA Miracle Seed (chia seeds) from my September Savorfull allergy-friendly box. (Savorfull offers a monthly assortment of full- and sample-sized peanut-free and/or dairy-free (your choice) and wheat/gluten-free food items, delivered right to your door. Plus no artificial dyes or flavors!) I had worried that they would be too seedy or weird-crunchy in my salad, but they were fine. Will definitely add again! Extra Omega-3s and fiber? Without adding a funky taste or texture? Sign me up! Including boiling the noodles and eggs (I went ahead and boiled a few more to put in egg molds, so choosing the molds and peeling the extra eggs and putting them in was also part of this whole time-frame;) freaking out on Facebook that my noodles weren't changing color, getting suggestions and then researching easy cheese sauces; settling the baby back down to sleep; and finding my chocolate stash and chocolate squeezy bottle, searching through my stash for something without artificial vanilla flavoring in it, and then melting, molding, and cooling the chocolates; both lunches took me less than an hour to put together. I've spent a lot longer on a lot less before! This. is. crazy. awesome. !!!!!!!! They have preschools for <1 year olds?! What do the kids do there? SchrefflerFamily - it's a co-op, so I'm there the whole time. For the baby class, it's really adult-interaction time. We get to ask "burning questions" and share tips and commiserate and such, while letting the babies be babies. This class has a different dynamic than most years in that E is one of the YOUNGEST in the class, which is very unusual for a December birthday! There is one child one day older than her (but bigger and crawlier,) and another much younger, born in June. Other than the one still in larval form, E and one other are the only non-crawlers, so there's a lot more action than usual for so early in the year. We even have a few walkers already! So far E just sits there staring at everything, and cries if anyone touches her. But it's nice getting to talk to other adults who aren't impatiently waiting for me to choose paper or plastic! Also, don't feel bad about not knowing the mouse's name, as officially it doesn't have one. My Muffin prefers the mini-Lalaloopsies, so she actually has two Crumbs Sugar Cookies, and ergo two mice. Hers are named "Pink Tail" (because it has a pink tail), and "Cookie" (because it has cookie ears). Yes, my daughter's naming skills are GENIUS. Ahem. Hahah! We have "Pink Bunny," "Pink Bunny," "Little Pink Bunny," "Big Pink Bunny," "Zebra," and "Moo." We're not very creative over here with our stuffies either!